Perfect for a first time user and multiple operators. Along with its easy-to-use design, the PostBase 30 postal meter features the quietest operation in its class, contributing to a quiet workplace environment that promotes productivity. A standard 5 lb. 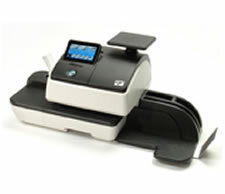 scale and 5 accounts make it the perfect entry-level mail machine for your office. Optional upgrades are also available. First in a series of computer connected-wireless mailing equipment systems.